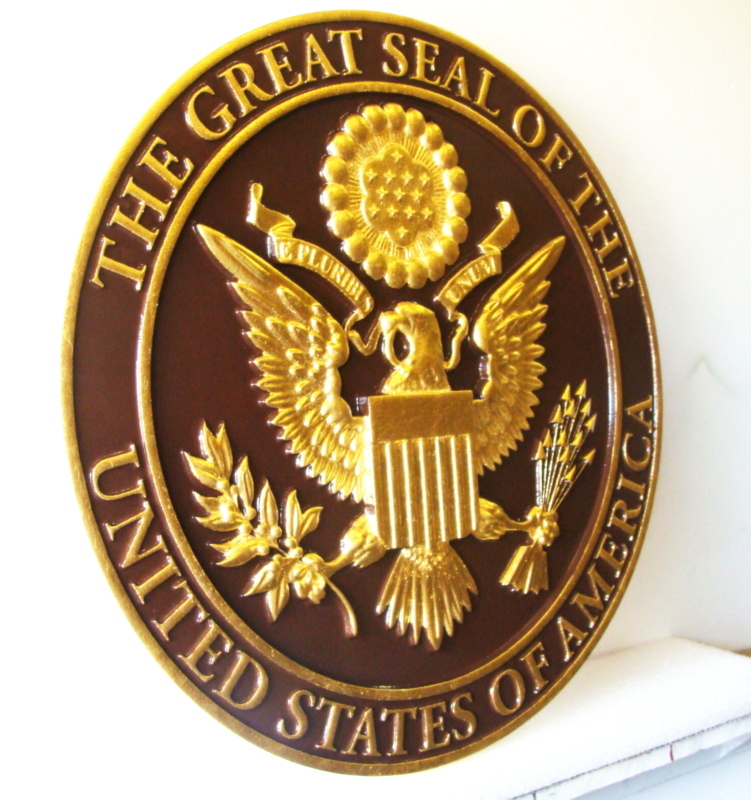 Shown above is an side view of a 24K gold-leaf gilded 3D bas-relief carved High-Density-Urethane wall plaque of the Great Seal of the USA (side view). The background is painted with a rich brown paint and the eagle is gold leaf gilded by hand by a skilled artisan. It was then given two coats of clear-coat. Please call us at 951-698-8484 or email us at info@artsignworks.com for design options, price quotes, and delivery schedule, and our knowledgeable and helpful Customer Service Representatives will respond to your requests promptly .We are proud of every sign we design and fabricate, and we are sure you will be pleased with your carved sign or plaque. Please click on Gallery 30 to see designs for Federal government plaques, including other versions of the US Great Seal. Our State government plaques are shown in Gallery 32. To see other Photo Gallery pages for great seals, including the US military branches (Gallery 31), Counties and Cities (Gallery 33), Universities & Colleges (Gallery 34), and companies, clubs and sport teams (Gallery 35), please click on one of the numbered gray boxes in the lower left margin of this page . To see prices or get Estimate and Order forms , click on gray boxes in upper left margin. Click on dark gray tabs on the header to see Home and other informational pages. Return to the Gallery 7 (metal signs & plaques ) page by clicking "Return to List" below right.